ASG’s new automation systems include a fixed table system and a torque fastening system. The fixed table system features the ASG X-PAQTM system with Ethernet IP module, a Toshiba Machine SCARA TH650A robot, 2 HMIs, and a newly developed process verification system. 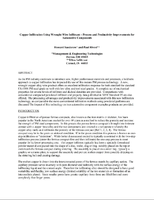 It increases overall production quality and safety, and reduce production costs. The ultralow torque fastening system features a small and lightweight driver with a torque range of 10 to 180 mNm (1.42-25.56 in-oz.). It has data collection, traceability, and graphing capabilities that provide visual assistance for rundown strategy. It is ideal for electronics, small medical device assembly, and various other applications. The CCS screwdriver is integrated on a Toshiba Machine TH180 SCARA robot. Cleveland, OH - ASG, a Division of Jergens, Inc, an RIA Certified Robotic Integrator, is co-exhibiting with TM Robotics at the biennial Automate Show in April 2019. Automate is organized by the Association for Advancing Automation (A3), and is one of the most expansive trade fairs and learning events for the automation industry in North America. ASG will be showcasing the AX-20 fixed table system for automated assembly. This system features the ASG X-PAQTM system with Ethernet IP module, a Toshiba Machine SCARA TH650A robot, 2 HMIs, and a newly developed process verification system. 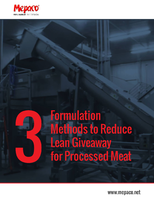 This system not only automates assembly, but also increases productivity, quality, and safety, while reducing costs. The innovative application of “Dynamic Driving” will also be on display! The dynamic driving demonstration simulates driving in a screw on a conveyor with the conveyor in motion! This NexGen arrangement, complete with Toshiba Machine’s Cartesian platform, ASG X-PAQ, screw presenter, and vision system, pushes precision fastening to new heights. Finally, ASG will be exhibiting the ASG CCS ultralow torque fastening system. The driver in this arrangement is small and lightweight with a torque range of 10 to 180 mNm (1.42-25.56 in-oz.). It offers data collection, traceability, and graphing capabilities that provide visual assistance for rundown strategy set up. 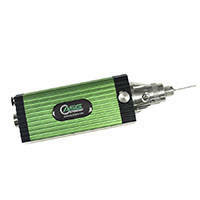 With its unique low torque range, this tool is ideal for electronics, small medical device assembly, and various other applications. The CCS screwdriver is integrated on a Toshiba Machine TH180 SCARA robot. ASG Technical Services Manager Doug Wright and Automation Sales Manager John Iskra will be in attendance. Visit them in booth 6763 and see how ASG and TM Robotics, with their unique solutions to automated assembly processes, can assist in your journey to “advance the technology of precision assembly”. ASG and TM Robotics formed a partnership in early 2017. This partnership was implemented to enrich the offering of unique and robust solutions to our customers. Through collaborative work on complex systems, this partnership has served to truly advance the technology of precision assembly. TM Robotics, in partnership with Toshiba Machine, offers a comprehensive range of Toshiba Machine Industrial Robots ideally suited for high-precision assembly, machine loading/unloading and material-handling applications that can be dust proof, clean room, or IP65/67. The company’s extensive product line starts with a Cartesian solution available in thousands of combinations, from single actuators to four-axis solutions to six-axis solutions that can include precise vision-control, as well as a complete range of SCARAs, from low cost to the industry-leading SCARA with 1200-mm reach that can carry up to 20 kgs. TM Robotics sells and services robots throughout Europe, Australia, the Middle East, India, Russia, Oceania and Africa, as well as North, Central, and South America. European headquarters are in Hertfordshire, England, and U.S. headquarters are in Elk Grove Village, IL. For more information, visit www.tmrobotics.com. 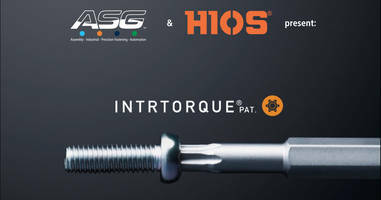 INTRTORQUE® Screw and Bit Combination features tapered end.